Catherine O'Brien focuses her practice on litigation and dispute resolution matters. During law school, Catherine served as an editor for the Vanderbilt Journal of Entertainment & Technology Law and an officer of the Entertainment and Sports Law Society. She also participated in an externship at Volunteer Lawyers and Professionals for the Arts where she helped represent emerging artists in Nashville. 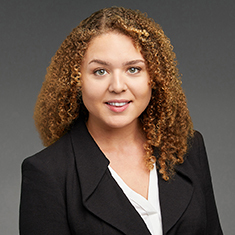 Prior to joining Katten, she served as a Public Interest Law Initiative (PILI) fellow at Lawyers for the Creative Arts and assisted artists in the Chicago area with a wide variety of legal issues. Shown below is a selection of Catherine’s engagements.